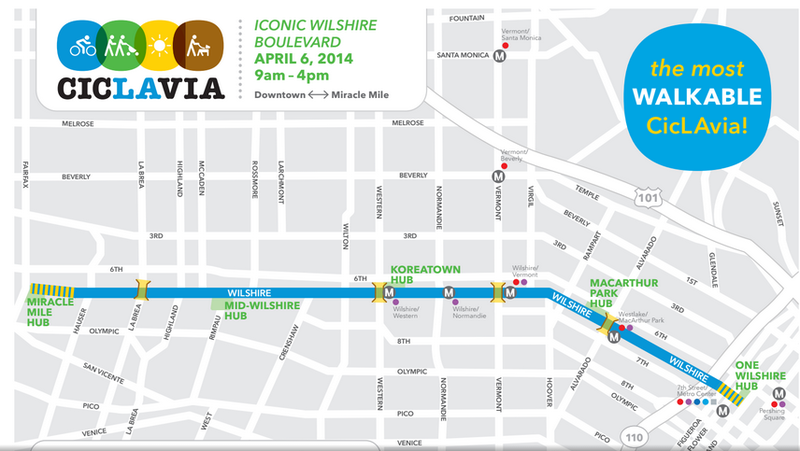 CicLAvia returns to Wilshire Blvd. this Sunday, April 6th, from 9 am to 4 pm. Wilshire Blvd. will be closed to motor vehicles all day from Fairfax Ave. on the west to Grand Ave. in downtown L.A. (In our area, Wilshire Blvd. can be crossed at Fairfax Ave. and at La Brea Ave.) This is expected to be the last of these events on Wilshire for quite a few years, at least until subway construction is completed. In addition to opening the street for bicycles, it is also open to pedestrians and, in addition to food, there are a number of activities along the way. One of these is the Mid City West Community Council’s Miracle Mile Art Walk, which includes museums and galleries along the Miracle Mile. The MCWCC booth will be located at Wilshire & Fairfax, near LACMA. You have March 6 instead of April 6 stated in the body of your announcement. You should correct it.